It's easy to learn a little something about Jesus, but to encounter him on a daily basis changes everything. No longer can we live with the same earthly behavior or attitude. Our focus becomes eternal. 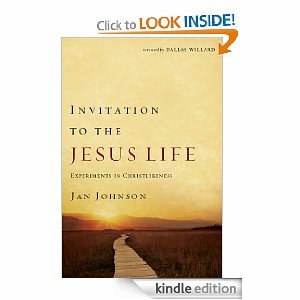 Jan Johnson helps readers experience Jesus in such a way that his love-drenched, others-focused nature shapes their character. Readers of all types will find the spiritual practices in each chapter inviting and challenging. Visit Invitation to the Jesus Life: Experiments in Christlikeness to pick up your FREE copy!! * Don't forget that Amazon has FREE APPS available so that you can read the FREE Kindle editions on your PC or other mobile device. be sure to scroll down; many have not expired yet. I so appreciate you posts for free kindle books. I also did a search and found a few others to download. Not necessarily to help me with my faith in Jesus... but good reads. I miss our chats. Glad you're enJOYing the FREE Kindle books :) There are LOTS out there to choose from! I miss our chats too! Will connect soon; it will be wonderful to catch up! Thanx 4 brightening my day! ALWAYS love hearing from you!